Paolo Bernardi, the coach of the top-ranked U.S. women&apos;s ski jumpers from Park City who resigned unexpectedly last week just three months before the Sochi Olympics, said he did so because he and the team were no longer "on the same page." "To me, it was not working anymore," said Bernardi, who served as the team&apos;s day-to-day traveling coach. Women&apos;s Ski Jumping USA had not commented on the 41-year-old Italian&apos;s departure until announcing Monday that it had found a replacement, Norway&apos;s Erik Renmaelmo, a longtime coach who worked most recently as an assistant for the Norwegian women&apos;s team. 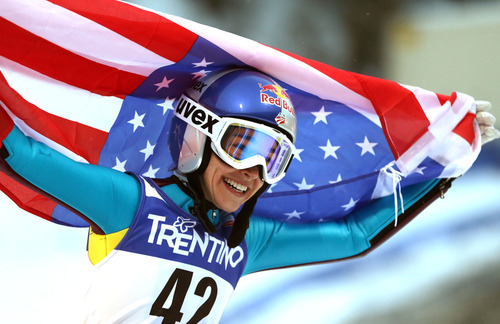 Renmaelmo will start his new job Dec. 1, just days before the World Cup season starts Dec. 6 in Lillehammer. "Erik will be a dynamic addition," said Alan Alborn, the Park City-based head coach of the team who will expand his coaching duties now. "We are fortunate to have this opportunity to welcome him as part of the Visa Team in what will be an historic season." Popular in the sport and known for his exuberant celebrations of good jumps, Bernardi said he "did too much" in the 2 1/2 years that he worked tirelessly as the team&apos;s traveling coach, too often ignoring his own life and family. He has a 19-year-old and a girlfriend with a 2-year-old daughter who live in Italy. The team recently rejected his request for an internationally based assistant, he said, forcing him into his decision. Bernardi helped lead the team to back-to-back Nations Cup titles  the overall World Cup team competition  and coached Park City&apos;s Sarah Hendrickson to the world championship last season in his hometown of Val di Fiemme. "I really need to take my time now," he said. "The last six months, me and the team were not on the same page anymore. … We were not driving the same way." The changes comes at a poor time for the ski jumpers, all of whom are from Park City and fought for years to be finally allowed into the Olympics. The start of the season is just three weeks away, with less than three months until the Olympics in Russia. Plus, Hendrickson is still recovering from a severe knee injury suffered in August, though she hopes to be jumping again by January. Bernardi said he has no plans except to head home and enjoy time with his friends and family, while cheering for the American women on the World Cup circuit and at the Olympics. He believes Hendrickson, Lindsey Van and the other women on the team still will excel without him. "They are amazing athletes and they are going to have great success," he said. Leaving now was a difficult decision, he said. "It was the hardest thing I&apos;ve ever done in my sport career before," said Bernardi, a former Italian national champion and ski-jumping coach for the Italian men&apos;s Nordic combined team. "It was a big disappointment for me, too, because it had nothing to do with the sport aspect. It&apos;s really said for me. … Most of all, though, I want to stay with my family."